Because I make a lot of (paper) notes at school, I started looking for a way to scan them into my computer. I tried some standard applications which do OCR and ICR, but both did not return good results. That is why I started making my own OCR/ICR engine. Normal letters are difficult for computers to read. An "a" looks like a "d", an "c" like a "e" or "o", etc. To overcome this problem, I created my own characters. 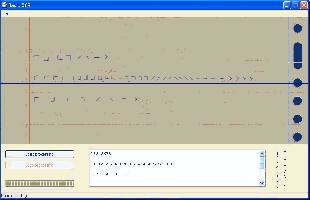 In the version of the program which comes with this post, eight different characters can be recognized and outputted as numbers corresponding to them. Just like with morse code and braille, you can combine two characters to create more combinations (8*8=64). For now, my program does not do this since it is far from done and maybe it still will be possible to let it read normal letters. I used a normal ballpoint to write my characters on normal paper with lines. To get better recognition results you can use a black fine-liner. # Loop through all pixels of the current column to see if it is empty or not. # of 9500000 or lower. # found character. Use these coordinates to "see" which character was written down. # one is greedier; it returns 1 more often. # returns Null if the pixel is empty. Included another example with this post. I use 100 DPI grayscale scans to be recognized, which gives pretty good results (100% recognition if you write the characters properly ). One thing you should avoid is scanning paper on which is written on the other side because it shines through a little bit.